We’d love your help. Let us know what’s wrong with this preview of A Master Passion by Juliet Waldron. 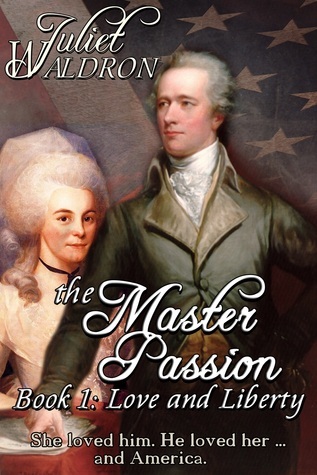 THE MASTER PASSION is the story of a marriage – called by some a misalliance – of Alexander Hamilton, our First Secretary of the Treasury, and Betsy Schuyler. Although born poor and illegitimate, Hamilton courts the daughter of Major General Schuyler, an American princess. Hamilton is one of a trinity of Founders who seem to have been created on purpose to invent our natio THE MASTER PASSION is the story of a marriage – called by some a misalliance – of Alexander Hamilton, our First Secretary of the Treasury, and Betsy Schuyler. Although born poor and illegitimate, Hamilton courts the daughter of Major General Schuyler, an American princess. Hamilton is one of a trinity of Founders who seem to have been created on purpose to invent our nation. Like all mission-driven men, he is preoccupied, often absent, and not the best provider. The trials of making ends meet and raising an ever growing troop of children are Betsy’s. This woman-behind-the-man is barely known, but through war, Indian attacks, multiple births, epidemics, infidelity, unending politics and dire tragedy, Betsy is the force which holds the family together. Like Aaron’s serpent, swallows up the rest..."
To ask other readers questions about A Master Passion, please sign up. In British West Indies a little over 50 years from its beginnings, Alexander Hamilton was born. It is hard to describe this amazing man living both a structured and unstructured life. Weaving enhanced accounts of his career into compelling storylines isn’t irresistible…but this author offers a fascinating read. I’ll admit to a lack of interest in our glorious and at times shallow history – compared to older cultures. At best, stories about a nascent Americana can be sometimes laborious to read. But the most enjoyable parts of this read and the objects that are most engaging are passages that center on the boy Alexander. They seem to fulfill the promise of an adult Hamilton who became fascinating in both real life and in this fictionalized account. Written in period style in language as rich as 18th century tapestry, I found the reading extremely detailed. But that is what aficionados of this period love and enjoy. It’s well-crafted tales like this about the proclivities of that period that lovers of history….love. The reading transformed this reader to an interested observer. The hardships of hard labor and harsh working conditions seemed mere steps from David Copperfield. Waldron serves the premise well that childhood struggles shape the character of adulthood. In Hamilton’s case, it is his struggles to survive childhood coupled with the strong and willfulness of his wretched mother. Both helped in carving the character of a man that would later become the much-loved subject of plays, movies and song. It is also a telling fact of how the culture of America has chosen to embrace the ideology that our founders were stalwart defenders of Christianity. Most of our strong and resilient historical patriarchs didn’t hail from stern Christian stock, rather from successess earned with skill, determination and a strong self-belief and love of country. With that comes a type of intelligence, in my opinion, that was needful to build the character of a nation they aspired to. It was a time of war, love and the birth of a nation and a better than fiction story about the life of a man born to live and lead on his own terms. My favorite character is young Alexander Hamilton. He learned to put aside childhood lessons of bitter betrayals in order to love a country and a woman. His will to build a nation survived amidst hardship and abandonment. He came to be during a time when the British West Indies was struggling to gain its own independence and existence. He was Alexander Hamilton, one of the founding fathers of our United States of America. An artful and illegitimate boy he was born to a mother left alone with two young boys. Together they struggled to come to terms with deep disappointments, abandonment, abuse, and poverty. Rachel Faucette a strong willed woman fed all of her anger and will into her strong but small boy who later used that will to not only survive but also strive to become one of pivotal leaders and hero in the birth of our nation. He married well if not his first choice. But Mary Schuyler was devoted and in love with Alexander. She understood best his love of country and commitment to its morals and tenure. Hard work and military bravery won him political bona fide but it was that political talent (that he shunned) and his extreme sense of honor that rewarded him with an early death at the age of 47 years. Alexander Hamilton is one of the founding fathers of our country and a perhaps one of the greatest minds in the history of our country. Betsy Schuyler is wife of Alexander Hamilton. Critiques The author has skill in storytelling. I had already read a fictional biopic on Richard III by this author (Roan Rose) and given my previous honestly negative experience I dreaded what she could write about the Hamiltons, especially with respect to Hamilton's notorius affair with Maria Reynolds. Well, thankfully Alexander Hamilton wrote so much about himself already that this author was probably forced not to stray too much from the beaten track, even if I personally do not agree with the overall picture of the Hamiltons’ marriage as I had already read a fictional biopic on Richard III by this author (Roan Rose) and given my previous honestly negative experience I dreaded what she could write about the Hamiltons, especially with respect to Hamilton's notorius affair with Maria Reynolds. Well, thankfully Alexander Hamilton wrote so much about himself already that this author was probably forced not to stray too much from the beaten track, even if I personally do not agree with the overall picture of the Hamiltons’ marriage as an overall frustrating experience on both parts. On one hand we have an Alexander Hamilton who is depicted as an unrepented flirt all his life, who chases skirts and repeatedly betrays his wife to satisfy his flesh during the times he and his wife are separate (with Maria Reynolds being only the most embarassing and notorious case, one that only gets a few pages and that in my view is never satisfactorily discussed by Alexander and Eliza in the book), a man who never really repents and feels sorry for his infidelities and ultimately only finds peace with his God, but not really with his wife, by deciding to throw away his shot and spare Burr’s life at the risk of his own life and his family’s welfare. On the other hand we have an Eliza Schuyler Hamilton who seems never to loosen up even after her marriage, whose constant virginal shyness clearly frustrates a man who seems to get her pregnant the few times he manages to coax her into love making while Maria ensnares him with her gymnastics, an Eliza who feels frustrated not only by her husband’s infidelities, but by her lack of selfesteem, especially in her relationship with a brilliant penworm and socialite husband, a woman who manages a household that is so efficient as it seems gloomy and sad for most of their marriage. Having most of the book based on her point of view did not exactly help having a pleasant feeling during the reading. In this overall depiction, I failed to see where the mutual love that is anticipated on the cover was, where was the passion that made Eliza decide never to remarry and spend the remaining 50 years of her life without Hamilton trying to save his legacy with the only wish to join him in a better world. I do not think the surviving correspondence (and I am not speaking only of Hamilton’s letters to Eliza) and their actions support this picture. Flawed and arrogant as the man was, despicable as his one year affair with Maria was, abominable as his decision to wash his dirty linen in public thus humiliating his wife was, he seems to have loved his wife better and more passionately than I could perceive from this text, just like Eliza seems to have had more spine than to quietly have accepted her husband back in her bed after the disclosure of the affair without a genuine repentace for his infidelity and a great deal of groveling on his part, as seems to have been more than the case in real life. A Master Passion is the story of our brilliant first Secretary of the Treasury, Alexander Hamilton, and his wife, Betsy Schuyler. It begins with their Revolutionary War courtship. Although born poor and illegitimate, as an Aide de Camp to General George Washington, Hamilton dares to reach, boldly pursuing Betsy, daughter of a wealthy and prominent New York family. After the war, Hamilton engages in nation building. Like all mission-driven men, he is preoccupied, often absent, and not the best provider. The trials of making ends meet and raising their ever-growing troop of children falls to Betsy, who accomplishes her task with grace and devotion. like Aaron's serpent, swallows up all the rest..."
Betsy's passion is Alexander. Alexander's passion is America. Though Hamilton's financial acumen and political courage is crucial to the formation and survival of our nation, his star sets quickly. Disillusioned, political power broken, his adored eldest son killed in a duel, Hamilton goes to his own famous duel with Aaron Burr in the spirit of those noble Romans he so steadfastly admires, preferring death to dishonor. The Master Passion places the battles of Alexander Hamilton, the lonely idealist, within a family saga rich in period detail. The great edifice for which he laid the groundwork--America--has become, exactly as he planned, the richest and freest country on earth. After developing an obsession with the musical Hamilton, I wanted to learn more about Eliza/Betsy Hamilton. My search led me to this book, which citing an impressive amount of research. So, it turns out the musical took a lot of liberties, but that's to be expected. This book was very interesting and told a story balanced between Hamilton and his somewhat long-suffering wife. If you are interested in Hamilton and not quite ready for the Chernow tomb, this might be a good read for you. I really wanted this one to work, but it just didn't. I agree with the reviewer who said it alternated between a historical romance novel and a dry biography. The characters never really came to life for me. And it's not helped by poor proof-reading. I slogged through it, but never really felt like it engaged for me. I never was drawn to pick it up. This was a pretty good book. Some parts read like a romance novel and some parts read like a very dry historical biography. Overall I enjoyed it even if I had to force myself to slog thru some paces. Great historical fiction! I was a little worried when I started this book, not sure if it was my taste, but I was soon engaged and found it difficult to put down. I highly recommend this historical novel. Thanks to Goodreads for the opportunity to read and review this book. Juliet Waldron was baptized in the Yellow Spring of a unique Ohio farm town. After some years in an upstate New York farmhouse with a resident ghost, she began to travel with her Auntie Mame mother, who flamboyantly adored history and grand opera. Returning to the States, got married and raised sons, eventually working at jobs ranging from artist's model to power-suited Merrill Lynch “girl.” Then, Juliet Waldron was baptized in the Yellow Spring of a unique Ohio farm town. After some years in an upstate New York farmhouse with a resident ghost, she began to travel with her Auntie Mame mother, who flamboyantly adored history and grand opera. Returning to the States, got married and raised sons, eventually working at jobs ranging from artist's model to power-suited Merrill Lynch “girl.” Then, she went off the deep end and began to write. She enjoys putting what she has learned about people, places and relationships into her stories. She has granddaughters she'd like to see more often, several cats, and just celebrated her 51th wedding anniversary with a guy who rides a Hayabusa and hasn't lost her off the back yet.